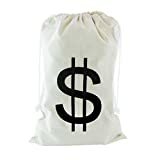 The cool new Money Laundry Bag won't help you launder any dirty money, but it will hold all your dirty clothes. 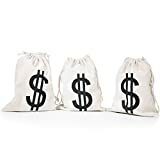 This 100% cotton laundry tote looks just like a giant money bag, complete with printed dollar symbols on both sides and a chromed plastic cinch. It's big enough to hold a week or two of dirty laundry and is perfect for lugging it all to the washing machine or laundromat, but don't get robbed on the way. 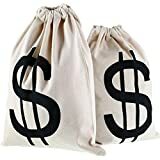 This bag could also be used as the ultimate money bag for collecting loose change. 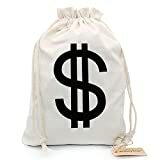 Just think how much you would have saved if you were actually able to fill this whole bag with coins!